Jordan Oaks is a great facility, but their manager is horrible. The rooms and amenities are great for what it is; however, the maintenance man wasn't there when my loved one's door broke in his shower. He couldn't take a shower, and it took them two weeks to get the door off the hinges and get him a shower curtain. The staff is very friendly. The food is of pretty decent quality. The rooms are handicap accessible and perfectly set for what he needs. Everything is really nice and kept really nice. I had meals with him in the dining hall. None of the residents like the manager. We had a horrible time getting his TV set up. The only thing that this particular manager needed to handle was his poor management that these things were not getting done, but now that he's settled, we very rarely have to deal with the manager at all. My visit at Jordan Oaks was excellent. It had a great atmosphere, and people were friendly. The dining area was excellent, and they had great facilities, like an exercise room. On July 3rd they had a nice, big cookout and a lot of people came over. My aunt is at Jordan Oaks and so far, so good. They've been very patient. The food is good. Her room is nice and the grounds are nice. They have an activity room and a chapel, but nothing really outstanding. Jordan Oaks was older than the other ones that I looked at in the area. I didn't feel that they were really into keeping the people healthy or giving them avenues to stay healthy. They were just there to live out their days on this earth. They had no fitness programs, and that's not what we're looking for. It was certainly adequate, but there was nothing special. The feeling I got was the people probably stayed in their little apartments all the time, came down to eat their meals, went back to their apartment, and did nothing else. It looked like people were enjoying their meals, and everybody seemed to be eating. If it was 1+ about the place, it was they did offer three full meals a day. That's the only place that I found that offered that. The staff seemed friendly. I visited Jordan Oaks, and it wasn’t for me. I am a little more independent than that, and I am looking for different kinds of activities and more mobility. I felt it was depressing. I didn’t feel there was any effort to provide any stimulation for the residents. The people seemed fairly happy, but they weren’t in groups. Those that I saw were singles and by themselves. There wasn't any activity. The person who took me on the tour was very good. I was with a friend who realized fairly quickly that it probably wasn’t going to be a good fit for me, but she still wanted the chance to show me because she was really proud of some of the things that they had organized. They seemed very positive. Jordan Oaks offered meals if you didn't want to eat right at the time they served them. I like that you could call and get something a little bit later, like if you slept late and you just didn't want to get up during breakfast time. The dining area was very open, had lots of windows, and had different sections to meet with friends and family. They also had a separate dining room if you want to have a birthday party. The rooms were very nice, and you could have a separate little dining area if you wanted. Jordan Oaks had a chapel, a game room, and reading rooms. The food was good. Everybody was very friendly and answered all of our questions. Jordan Oaks was excellent. Their apartments were nice and comparable to the others. The staff was very nice, and the residents I met were very friendly. The dining area was nice. I didn't see any activities going on when I was there. The location was out of my range, but the price was comparable. Jordan Oaks was very clea, modern, and newer than the other place I visited. They had some kind of healthcare system where the people would wear something around their neck in their room that will alert the staff. It was an independent living facility, and you would have to buy the home healthcare services a la carte. They had laundry facilities. Jordan Oaks only had one elevator for 3 floors, which we didn't like. It also seemed like there wasn't a lot of interaction with the residents. As soon as they ate, they were all gone and nobody was in the lobby. The staff that assisted us did their job fine but we didn't feel like the place was right for my mother. They had a craft room and choir. The dining area looked just fine. Another elevator would be great. Jordan Oaks's actual grounds and area were very beautiful. They had regular activities that went on, and they also had a place where they could sew or watch movies. They had a calendar with daily activities, and it was very nice. It seemed they were very engaged with the residents. It's kind of like they want to know what you like to do, and it seemed like they were very accommodating and would try to make those things happen. They have doctors making house calls and a hair salon right there where you could get your hair cut and your nails done, which are some conveniences and services they offered. They were extremely welcoming. They had a sign up as we walked through the door that welcomed my mother-in-law with balloons, and that made her feel really special. It meant a lot to us and to her. The staff was friendly, knowledgeable, and accommodating. Jordan Oaks was a very nice and attractive place. They did the full tour of the place -- the rooms, the different options they had for recreation, and the dining. The room was an apartment type with a bath. The staff was very nice and very pleasant. I would recommend it as a community. My grandfather moved into Jordan Oaks, it’s very clean, and everyone was friendly. The food was great, and it was more of a gourmet. They have waiters serving 5-course meals, they bring you coffee and appetizers, and it’s very much like a fancy restaurant. I don’t think it was expensive, since the meals are included. They have been wonderful. I visited Jordan Oaks. I love this place, but I can’t afford it. The atmosphere there is just open atmosphere. I like the size of the rooms. At the cafeteria, they were so excellent. We ate lunch there. The food was excellent. It was a very good community. One thing that they offer is you get a pendant or a bracelet, and if you have any problems in your room, there is someone on duty 24/7 to come to your aid. They have a salon there to get your haircut or wash or set. They have a podiatrist that comes in for footcare. They have a gym or recreational things for you to use. Jordan Oaks was very clean and nice, but I was struck by the lack of green space. However, the room was very nice, very pleasant, and very clean. The staff was very polite and answered all of the questions that we had. The people were very nice and very helpful. It was a good-looking place. Jordan Oaks has three meals a day, a chef cooks for you, and they have snacks. They take you into different stores and places. You can have a small pet there. The apartments are of decent size, I was looking at a studio which will be available on the 1st week of April, the dining room is very nice, and they have an athletic room for exercise. All that I have met are very nice. The have a lot of walking areas and I like to walk. I visited Jordan Oaks a year and a half ago. The experience was nice. It was an older community. The apartments were not as open and airy as the other places we visited. There weren't a lot of windows, so the rooms were dark. It just looked outdated. The community as a whole was great. I just thought that they needed to update the hallways leading to the rooms and the windows. The food was very good. They had a beautiful dining room. When I was there, a group of people came in and played the piano for the residents while they were eating. They had someone working there full time with the residents to improve their health. They had an exercise room, went on field trips, and a lot more activities for the residents. My aunt moved to the Jordan Oaks. Everything is doing well. Everyone in the place has been great. It’s a modern well-kept facility and they keep the residents active. They do have different functions for them if they chose to. Jordan Oaks was a nice place. It just did not seem quite as modern and updated as some of the other places. I really like the manager at Jordan Oaks, and I just like the community as a whole -- the size of it, the features, and the benefits that they offer. I really liked the size of their apartments. So far, it is good. It is the staff and the services there. Everyone has been great, and I love the on-site therapy that they offer. My mother complains about the food sometimes, but that may be just her and not necessarily the food. I went to Jordan Oaks, and it was a perfect facility for me. It would be close to my children, closer than I am now. When you first walk in, you walk in to this beautiful foyer, and everything is decorated so elegantly. To the right, there was a big baby grand piano, and as you go into the dining room, somebody plays during each meal -- impressive luncheon dinner, very elegant, and the dining room itself was like a four-star restaurant. They have a four-star chef and a nutritionist that works there full-time to meet all the nutritional needs of the residents. So they work extensively with the chef on what people can have and cannot have. They serve breakfast at a certain time in the morning, lunch at a certain time, and dinner at a certain time. But if you miss breakfast, they have sort of like a little meeting room -- a coffee room on each floor -- that they keep fresh fruits, cereal, and sweets in, and they have a refrigerator in there. I thought Jordan Oaks was fantastic. I liked the fact that they knew everybody as they took me on a tour, they can remember names, they talk to each and every person, and they seemed to get a lot of care. I thought they were really good. It was a very clean place. The meal kind of felt like fine dining. It was very nice. I like the way the rooms were setup. They have elevators, they have several call buttons all over the room, and there's someone on 24 hours a day in case help is needed. I really did like the place. If I had the finances, I'd move in there myself. They go out on film trips or concerts, they have a beauty salon, and they have a lot of activities set up on the wall posted. They're no more expensive than the rest of them. I liked how orderly and clean Jordan Oaks was. Everybody was very friendly. I met two or three staff. They were very pleasant and knowledgeable for whatever they were doing. They had a variety of different options for their rooms, depending on affordability. The room space of the studio was a little on the snug size, but for the money you are paying, I think it was appropriate. The next size would have been better, but of course, the price goes up a fair amount, too. It was adequate for one person. The sanitation was excellent. They had a lot of activities going on all the time. They had a social calendar, which they change every month. They food was very good. They had a chef, and the menu currently changes quite regularly per meal. I especially appreciate the portion control. Some places, when you go out to eat, they gave you this huge amount, which for me is overpowering. I don't feel like eating because there's so much on the plate. There it had nice quantity, and it was prettily presented. The only negative part was that the residents looked a little down or depressed. Maybe because they knew each other too well and there's nothing to talk about. Mom was at Jordan Oaks before she moved into an assisted living facility. She lived in this facility for three years. Overall, her stay there was very good. The facility was very nice. The staff was very helpful and friendly. They had a dining room and the food was very good. They do offer lots of activities like bingo, exercises, and they also went out on trips. I like Jordan Oaks because I know this part of town. It's close to the VA hospital. The staff was very nice. We ate with them at a lunch meal. It was nice, it was fine. From walking through one time, it's just not the place that I wanted to be. I did visit Jordan Oaks. It was a wonderful visit. Everything was good. The care and the amenities they offer were good. The only thing I would say about this facility is that they could improve on updating their furniture. 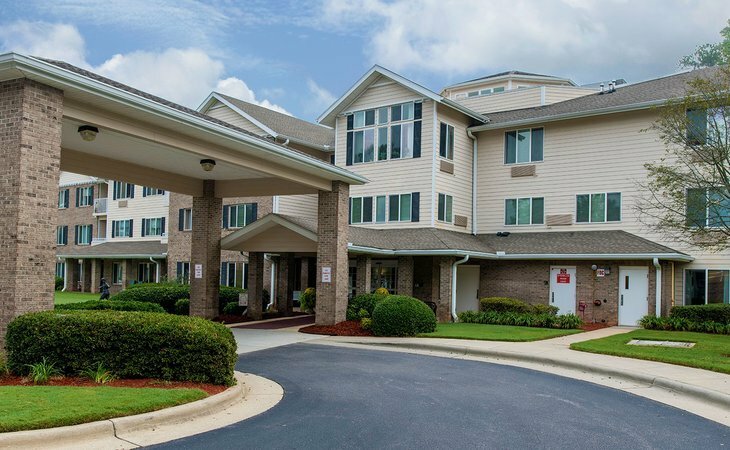 Jordan Oaks is located in Cary, NC, providing a vibrant backdrop for your new life as a valued member of our caring community. So come to Jordan Oaks for a visit...and stay! *We understand that each individual is unique and that needs may change over time. Holiday Retirement does not provide any health care services. However, residents are welcome to receive services from any outside home health care provider of their choice to help them continue enjoying life at our community. What should caregivers and potential residents know about Jordan Oaks?